One of the options for browsing the Marchand Archive is to use the “Topic/Theme” menu on the right side of the Image Collection page. Most of the “Topic/Themes” were identified by the historians who contributed to our collection, in particular, Roland Marchand. The title of the topic or theme and the selection of the images filtered by historian can provide some insight into how they used them when teaching. 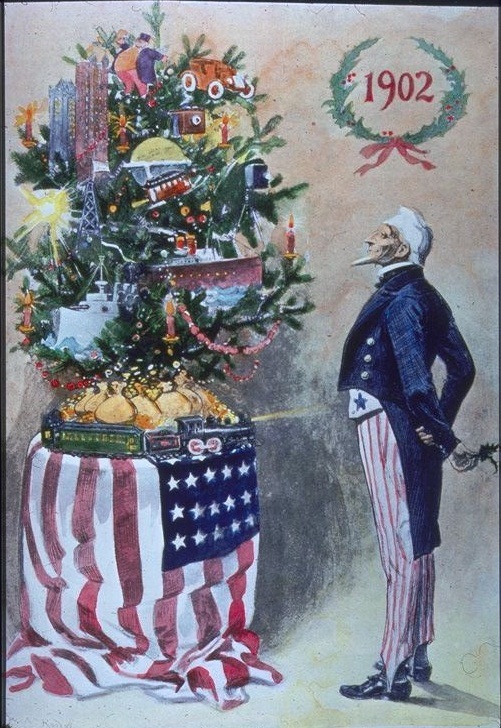 In today’s post, we invite you to check out three images of Uncle Sam at Christmas simultaneously organized under the topics “Symbols, U.S. Nationalism,” and “Industrialization.” Considering the three images representing 1802, 1852, and 1902, provides some food for thought on how Americans were thinking about themselves and what they considered to be their nation’s achievements over course of the Nineteenth Century. 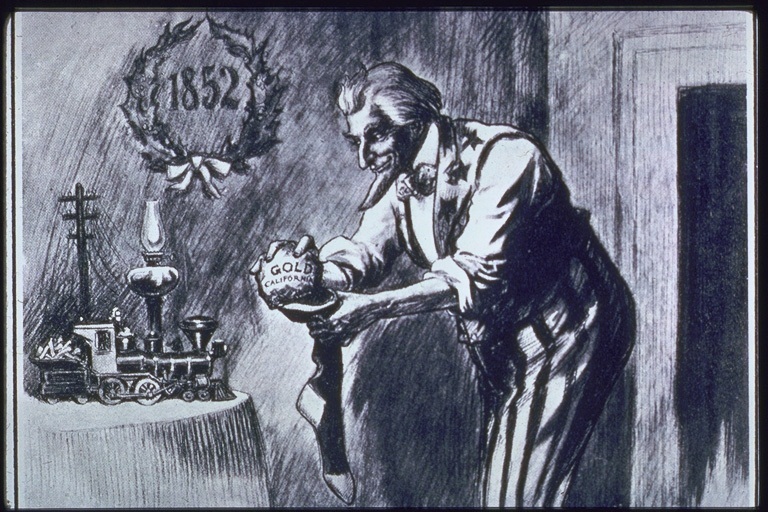 Uncle Sam in 1852 with gold from California, a small train and telegraph pole. 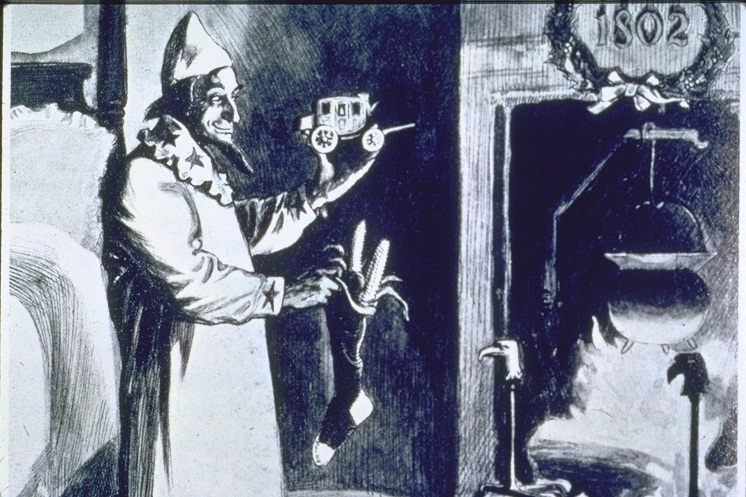 How would you guide students’ analysis of this series of images in your classroom? Share your thoughts here. 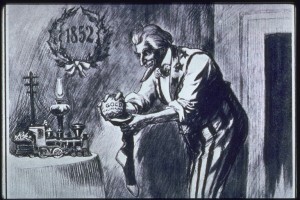 This entry was posted in U.S. History and tagged Industrialization, Symbols, U.S. 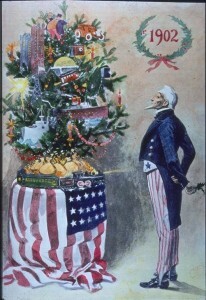 Nationalism, Uncle Sam on December 21, 2011 by jbcosca.